Jerry and Judy’s Diocletian Garden is not only a source of pride and enjoyment but is an example of Humanists doing good in the community through their contributions to food banks in Maricopa and Casa Grande. Experimentation taught them what grows best on their plot of land and when to plant it. Then Jerry and Judy started selling their vegetables at a local farmers’ market, preparing their produce for sale, transporting it to the market, competing with others who sold what they had not grown themselves. 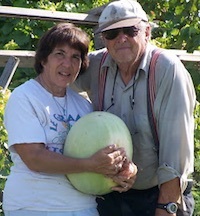 After a few years the Walps decided it was more satisfying to skip the hassles of retailing and give their bounty to those who might not otherwise have access to fresh, healthy food like the beets, carrots, broccoli, chard, cabbage, tomatoes, melons, squash, peppers, onions and garlic that they grow at various times of the year. This year they expect to donate about 13,000 pounds of fresh produce to the food banks. And they get the satisfaction of sharing some of that healthy lifestyle with others in their community.